Some clouds this morning will give way to generally sunny skies for the afternoon. High around 80F. Winds S at 10 to 20 mph.. Partly cloudy early followed by cloudy skies overnight. A stray shower or thunderstorm is possible. Low around 60F. Winds SSW at 10 to 15 mph. 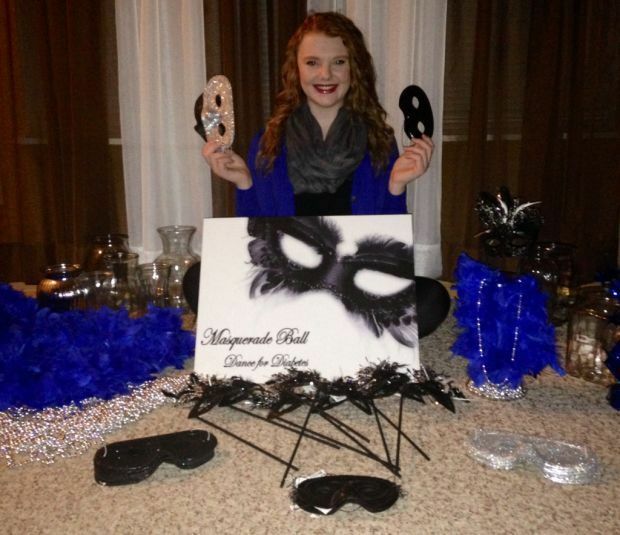 Aubri Smith is organizing a winter masquerade ball Jan. 23 to benefit JDRF. Aubri Smith hopes that one day she can tell people she used to have diabetes. The 17-year-old North County junior was diagnosed with the disease two weeks after her second birthday. "I have grown up learning to count carbohydrates, making sure I always drink water or diet soda, and limiting my intake of sugary/starchy foods," she said. "I had to take shots of insulin for seven years before I was placed on an insulin pump. "For the first six years after my diagnosis, I had to take two shots per day (one in the morning and one in the evening) and was limited on how much I could eat. If I was still hungry or if I just didn't feel like eating, I still had to stick to my regimen because I already received the insulin. If I didn't eat, my blood sugar would go low. If I ate too much, then my blood sugar would go high. She said it was really hard for her to regulate her numbers to what they should be because she was so young and her appetite was never consistent. "For the year prior to being placed on the pump I was on a different insulin regimen which worked more like how the pump works," she said. "On this regimen I was up to eight shots per day and was only in second grade. I took a shot in the evening of long-acting insulin and carried a pen with short-acting insulin in it around with me to give me a shot each time I ate." Right after she began third grade, her endocrinologist said she was ready to be placed on an insulin pump. "I was ecstatic that I didn't have to give myself so many shots anymore," Aubri said. "I have been on a pump for eight years now and love the freedom it gives me to live a more 'normal' life. I am able to sleep in and have more freedom of when and how much I can eat with the pump. I only change the pump site every three days, which is like getting one shot every three days instead of getting eight shots every day." "Although the pump makes having diabetes more manageable, I'm praying that one day I can say, 'I used to have diabetes.'" Aubri has helped with Juvenile Diabetes Research Foundation fundraisers. She has participated in Diabetes Walks and has raffled off baskets. 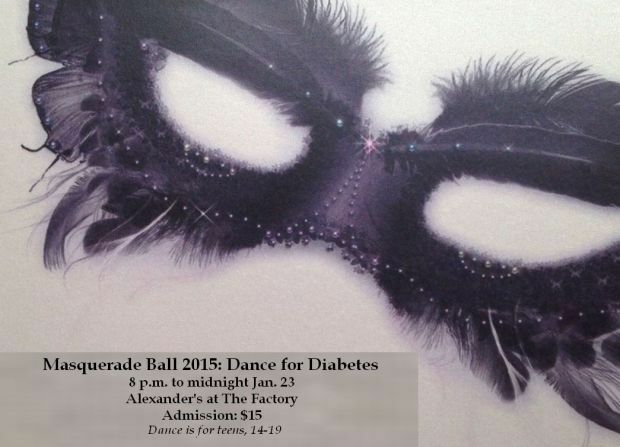 Now Aubri and her mother, Diana, are planning "Masquerade Ball 2015: Dance for Diabetes" as a fundraiser for JDRF. The ball will be a semi-formal event for teens ages 14 to 19. It will be held from 8 p.m. to midnight Jan. 23 at Alexander's at The Factory in Farmington. Pre-sale tickets are available now for $15 and include a picture CD. Tickets will be sold at the door for $15. Picture CDs will be sold for an additional $5. Masks are required upon entry. Aubri said masks can be found at party supply stores in the Mardi Gras section or online. If anyone has difficulty finding one there will be a limited number of masks available for purchase at the dance. Light refreshments and snacks will be served and additional food will be available for purchase. No outside food or drinks will be allowed. A variety of baskets will be raffled off. Winners will be announced at the dance but do not need to be present to win. For more information about the ball or to make a donation to the ball call 573-701-2476 or 701-4177. Teens can share their stories about diabetes. Right now four speakers are scheduled to speak. Any teen interested in sharing a story can email Diana Smith at jdsmith921@yahoo.com Also, if you have a teen with diabetes and would like to add his/her picture to a collage to be displayed at the dance email a photo to the same email address and let them know if the teen wants to speak. Aubri came up with the idea for the ball in November. "Back in November, some friends and I were talking about how we'd like to have a formal or semi-formal dance in the fall," she said. "I've always wanted to have a masquerade dance because I love the whole masquerade theme (dressing up, the masks, and just the overall sophistication that is involved). "I suggested we have a dance to raise money for juvenile diabetes since I was diagnosed at such a young age and have always looked for ways to raise money to help find a cure. I obviously could not get the dance together in the fall since it takes so much planning so I decided on a January date." In the future, she plans to make the dance an annual event in November in honor of Diabetes Awareness Month." They are both very excited about the fundraiser. "There's not many options in the area for good, clean fun," Diana said. "Through a support group that my parents started several years ago, I have met others with diabetes in the area which have helped me to realize that I'm not the only one going through this," Aubri said. "My experiences have helped me to become an advocate for juvenile diabetes research because I not only want to find a cure for myself, I want others to also be able to know a life without the daily finger pricks, shots, and the effects of high and low blood sugars; all of which make it so hard to be a diabetic. "Having diabetes really stinks but it has helped me to become who I am today. I hope to raise awareness for juvenile diabetes by having this dance and to let others with it to know there is support out there." Her parents say Aubri has never let diabetes stand in her way. She has been very active in studio dance, theater, choir, middle-school cheerleading, and now is a third-year member of her high school dance team, the NC Raiderettes. She even performed in the London New Year's Day Parade. Parents of children with diabetes or adults with diabetes may request to join their online diabetes support group through Facebook, called POD (Parents of Diabetics) to seek the support you or your child may need, ask questions, or leave feedback for others seeking support. According to JDRF and the American Diabetes Association, Type 1 diabetes, also known as juvenile diabetes or insulin-dependent diabetes, occurs when the body's immune system attacks and destroys certain cells in the pancreas. Those cells (called beta cells) are contained, along with other types of cells, within small islands of endocrine cells, called the pancreatic islets. Beta cells normally produce insulin, a hormone that helps the body move the glucose contained in food into cells throughout the body, which use it for energy. When the beta cells are destroyed, no insulin is produced and the glucose stays in the blood where is can cause serious damage to all the organ systems of the body. For this reason, people with type 1 diabetes must take insulin to stay alive. This means having insulin delivered through daily injections or through an insulin pump, and requiring the blood sugar to be tested six-to-eight times a day. People with diabetes must carefully balance their food intake and exercise to regulate blood sugar levels to avoid low blood sugars (hypoglycemia) or high blood sugars (hyperglycemia); both of which can be life-threatening. The warning signs of type 1 diabetes include extreme thirst, frequent urination, drowsiness or lethargy, sugar in urine, sudden vision changes, increased appetite, sudden weight loss, fruity, sweet, or wine-like odor on breath, heavy, labored breathing, stupor, and unconsciousness. Type 1 diabetes is generally diagnosed in children, teenagers, or young adults. Scientists do not yet know exactly what causes type 1 diabetes, but they believe that autoimmune, genetic, and environmental factors are involved. Diabetes remains the seventh leading cause of death in the United States. About 208,000 Americans under the age of 20 are estimated to have diagnosed diabetes, which is about 0.25 percent of that population. In 2008-2009, the annual incidence of diagnosed diabetes in youth was estimated at 18,436 with type 1 diabetes and 5,089 with type 2 diabetes. Diabetes prevalence also varies by race/ethnicity.